Each #10 can contains 1.5 pounds of Dehydrated Carrots. Puff-Dry Dehydrated Carrots are produced in a process where moisture is removed in a special drying process called puff drying. The carrots are dehydrated to approximately 7% moisture. The process permits the carrots to maintain their orange color and typical fresh carrot taste when re-hydrated in water. 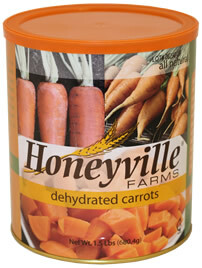 The vitamin and nutrient qualities of fresh carrots are preserved and concentrated in Honeyville's Puff-Dry Dehydrated Carrots. Freeze Dried and Puff-Dry Dehydrated products are less expensive than wet pack food because you are not paying for all the water. The taste is great, the nutritional food value is excellent. Freeze, and puff drying provides natural and additive free fruits and vegetables to be stored effectively for long periods of time. Remember Freeze Dried, and Puff-Dried vegetables are stable products with a long shelf life and no additives or preservatives. Shelf Life: Dried Carrots may be stored in the sealed #10 can (with included oxygen absorber packet) for 10 to 15 years under ideal storage conditions (a cool, dry place).